CounterPoint SQL now supports miscellaneous kits, which allow you to associate any number of component items with a single, "miscellaneous" (i.e., Non-inventory or Service) parent item. When a user sells the parent item in Ticket Entry or Touchscreen Ticket Entry, the associated components are added to the ticket automatically. Unlike tag-along kits, each component of a miscellaneous kit is not treated as an individual line item. Instead, all of a miscellaneous kit's components are grouped together below the parent item, which means that the component lines cannot be separately edited, moved, or deleted. Further, the total price of a miscellaneous kit is always based on the parent item's price, which is allocated among the component items in proportion to each one's individual Price. 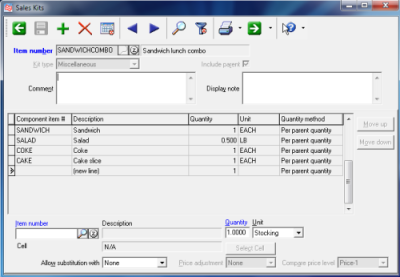 When you define a miscellaneous kit, you can specify whether users can substitute Any Item or Defined Substitutes only for each component (or Other Grid Cells for gridded components). You can also indicate whether the total price of the kit will be adjusted to account for price differences between the substitute item and the component, along with the price basis for the adjustment (i.e., Price-1 through Price-6). 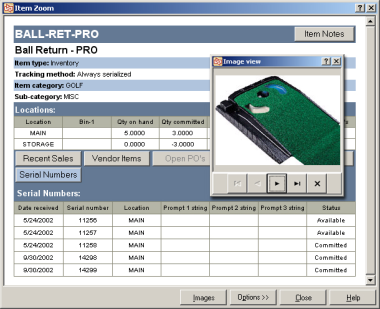 Serial number tracking provides a detailed record of each piece of merchandise—when it was received, what it cost, which customer bought it, when it was bought, warranty expiration, etc. Serial number tracking is beneficial to any business that sells bigticket items, tracks product warranties, or deals in regulated commodities. Serial numbers can be entered in inventory adjustments, quick receivings, purchase order receivings, quick transfers, transfers, and ticket entry (including same-day sales and returns). Detailed historical activity is retained for each serial number transaction (receiving, sale, etc.). Historical details are available on reports, views, and Zooms. management controls. Recording of serial numbers during receiving (or other transactions) is optional. To ensure that you keep good records, you may specify for each item whether serial numbers are required when selling and returning. The sometimes serialized tracking method is useful for businesses that don’t track in-stock serial numbers, but may want to record serial number information at the time of sale.